I've had bad luck with DIY projects lately. Apparently I was so focused on making sure the chevron pattern went the right way (horizontal) that I forgot to flip the letter when I traced. This was my instagram picture with the caption "this DIY couldn't have been simpler... "
Luckily I had another sheet so I tried again. And then even though it was almost perfect, I tried to rearrange it, and...well you see the picture. Finally on the 3rd attempt, I got it right. I only had 3 sheets of the paper so it was do or die. Close up, it's not perfect but I learned from my prior mistake and let it be. I sent my friend a phone picture and said the blog post would be titled "Decoupaging a Letter--It's Harder Than You Think." Oh well. My takeaway: it's much harder to decoupage with lightweight paper. This wasn't cardstock or even close. Also as a side note if you've never tried matte modge podge, try it! I like it so much better than glossy and it seems to hide the wrinkles better. 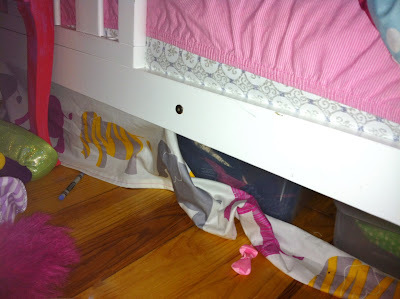 I was really excited to share my latest accomplishment in Genevieve's toddler room, but before I even took the time to blog this bed skirt, it started falling down. I used the Young House Love guide as a reference and used Velcro to attach it to her bed. It was falling down the next day. I can only assume that didn't happen to Sherry. Stinking DIY geniuses, those two. BUT in true Tiffany fashion I didn't really take my time and dust or clean her bed with rubbing alcohol (as the Velcro packaging suggested) so I took the entire thing down, did that step, and added more Velcro. I took this photo the next day. Next up? A hot glue gun. If that doesn't work, I'll just cry. And sorry for the bad photography but I couldn't see whipping out the DLSR and editing...it would be like adding insult to injury to spend that amount of time documenting this fail. 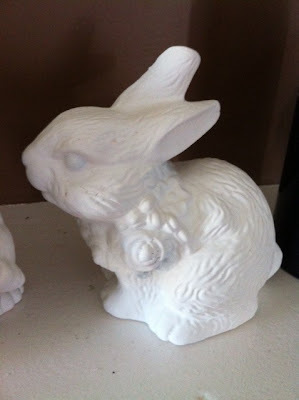 I saw simple and modern rabbit figurines at Target for $12.99. I figured I'd just find a couple at thrift stores and spray paint them. Easy peasy right? Wrong. I found an almost perfect pair at Salvation Army for $2 each. 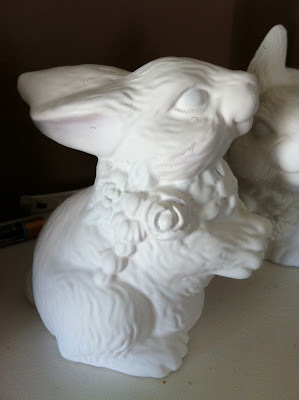 I say almost perfect because I could've done without the ring of flowers around the bunnies' necks. Nevertheless with flat white spray-paint on them, they looked great. Until I went out to the garage the next morning and found the cracks. I assume it was due to the cold overnight temps? 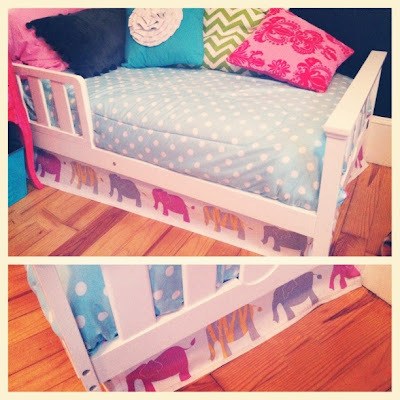 As a side note, I wish I'd used flat paint for Genevieve's elephant hook (and I still might). I love the look of it and it would have made it look even more similar to the anthropologie version. There is no happy ending to this story; it's just my effort to stay true to my mantra of keepin it real. It's also a cautionary tale that DIY doesn't always pan out. You're probably saying "Duh. That's why people buy stuff" And you're right. I just happen to be cheap frugal and lately seem to have more time than money so I have to at least try...and in the cases above I don't know that I would have rather spent the cash. -As for the letter, in the end it did come out great and besides 2 pieces of scrapbook paper I already had, it didn't cost me much (not counting the few gray hairs I most definitely sprouted as a result of my frustration). -Genevieve's bed has slats across it so I couldn't use a typical bed skirt even if I wanted to (and do they even make those for toddler beds?). 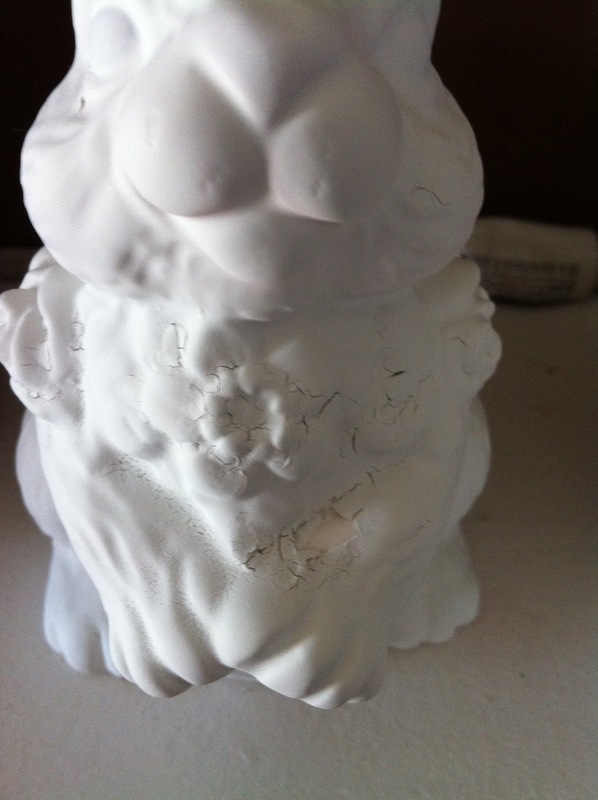 -While the rabbits failed me, I'm not sure I could justify spending $26 on bunny figurines so at least I tried. Next Easter when the pain has subsided (I'm not dramatic or anything) I'll probably try sanding them down and painting again so maybe I can turn this fail into a success. So you win some you lose some. It's all part of the game right?! I like to think for every big fat FAIL I have a few raging successes. 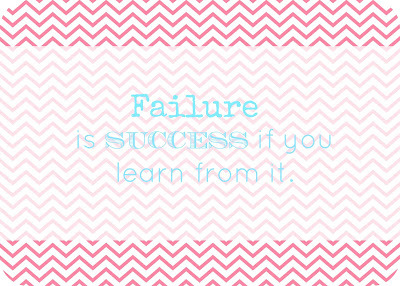 And I definitely learn a thing or two every time I fail. And how does that quote go? 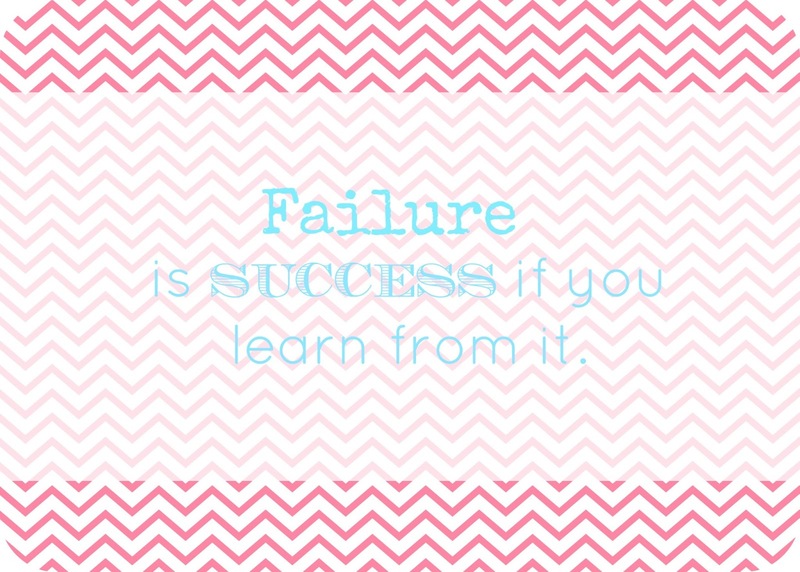 Failure is success if you learn from it? Dear Lord, I hope so. So tell me, what was your latest DIY fail? While my upcoming cow party isn't super mainstream, I had the same struggle with throwing this party vs. something super cute and fabulous that I chose. But I love what you said-it's all about the little. We wouldn't be doing it at all if it weren't for our sweeties, so focusing on them is key. Will a cow party be as cute as a mustache bash? Maybe not, but my guy chose this theme and is going to love every minute. Plus, a creative challenge is always a good thing, right? I think the party turned out fabulous and very modern, clean and not a typical character party at all! Great job! I love this, Tiffany!! I'm afraid i chicken out of a lot of DYI stuff for fear of failure. This post reminds me that it's okay to not always get it right. Thanks!